Home > Meteorite Jewelry for Men Women Pendants Earrings Necklaces > Large Meteorite Jewelry Pendant Necklace Stainless Steel - Sold! Large Quality Iron Meteorite Jewelry Pendant Necklace, Stainless Steel with Black Cord Chain, for men or women. 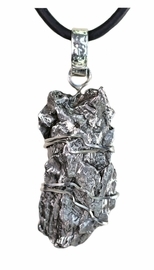 This extraordinary Campo del Cielo is the perfect meteorite make this necklace, using stainless steel wrap, with 22" black cord chain for guys or gals! Meteorites are one of the very best gifts to give, as they transport us with their beauty and charm into the realm of the great cosmic unknown - helping to tie us to the wonder and mystery that is a part of our universe. Pendant Size: 2 1/4" L X 7/8" W X 3/8" D, Weight: About 29 grams; Suitable for the larger framed person. The Campo del Cielo crater field, where these meteorites are found, is located in Argentina and Paraguay. The craters age is estimated to be about 4,000–5,000 years old. The meteorites and their craters had been already well known to the native inhabitants of the area. They are thought to have been first discovered and the craters explored by the outside world in the 1570's. This meteorite necklace is shipped in an attractive jewelry box with information about meteorite space jewelry and a Certificate of Authenticity. A rock from space - awesome!